"Just because you're not looking at something, doesn't mean it's not there." 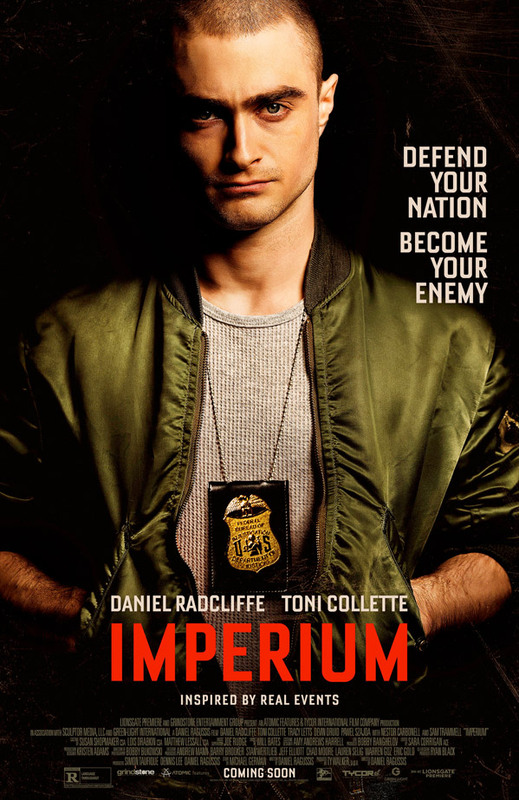 Lionsgate has unveiled a trailer for a film called Imperium, starring Daniel Radcliffe as a young "analyst" who goes undercover as a Neo-Nazi in order to figure out the inner-workings and help take down a radical right-wing terrorist group. This actually looks quite intriguing, with Radcliffe going all-in with this role. The full cast includes Toni Collette, Tracy Letts, with Nestor Carbonell, Burn Gorman and Sam Trammell. I'm impressed by the choices Radcliffe has been making ever since Harry Potter, he seems to enjoy challenging himself with unique roles working with up-and-coming filmmakers, and it's refreshing. This looks like it could be good. Nate Foster (Daniel Radcliffe), a young, idealistic FBI agent, goes undercover to take down a radical right-wing terrorist group. The bright up-and-coming analyst must confront the challenge of sticking to a new identity while maintaining his real principles as he navigates the dangerous underworld of white supremacy. Imperium is both written and directed by filmmaker Daniel Ragussis, making his feature directing debut after a couple of short films (Word Is Bond, Haber) previously. Based on a story by Michael German, inspired by real events. This film has not premiered at any festivals yet. Lionsgate will release Imperium in select theaters + on VOD starting August 19th later this summer. Interested in seeing this? I appreciate the challenging role, and am becoming a big fan of Radcliffe, especially after watching Swiss Army Man, but this one seems a bit weak to me. Acting/writing feels on the nose. I get what you are saying...almost seems like a David Ayer flick. He was amazing in Swiss Army Man. That is probably true. But I also have to be honest: I prefer Paul Dano and, for me, he's better reason to watch that funny flick. But then again, Radcliffe might also be good judging from said above, right? And that's a matter of perspective. When you live in Europe things look different. English speaking culture is something that comes from the outside and you react on it. In fact, I (and everybody else in Europe with such interests) have multilayered job, if I could say so. Learning English culture and other cultures is made to be in tune with many different cultures. Spanish, French, German, Russian movies and books that are out of focus in US (for the most, I guess) are very much present here. And some others, not necessary European, of course. My daughter is close to that and is also watching a lot of movies that you would call subtitled. And reads a lot of non-English stuff. Oh yes, don't worry, she prefers more and more those, not for everyone, films (whatever that means). She likes English language and English speaking culture (like all true European girl willing to learn different languages and cultures) but mostly she's much more interested in Roman culture, learning French language and culture (which she plans to study along with the anthropology - and she's thirteen so we still have to see is that really going to happen). Learning German language for her is investment in future. But Harry Potter was an exercise in English language for her because she mostly read all those books about his, huh, adventures, in English. Movies just came along, she prefers books. That new film about it, something about the Beasts-and-where-to-find-them related to it is not interesting for her anymore. She's passed that. Bo, I just described in my previous very shortly post her growing up. And believe me, it's quite different today than it was twenty or thirty years ago ... Cheers! I like what Radcliffe is doing in taking some challenging roles. But from what I see in trailer, I can't tell if it's mis-casting or not, buzzcut or not, he's just not very convincing as a skinhead. He might as well be holding a sign that says "I'm a cop".